Greenlee 45504 Specifications: 9" Crimp Frame Greenlee 45504 Features: Used to manually crimp a wide variety of connectors and terminals to factory specifications. Frame features a precision full-cycle ratchet for accurate, repeatable crimps every cycle. Crimp release lever improves throughput by eliminating rejected termination.. 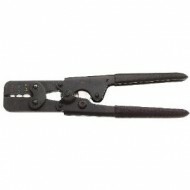 Features: Scotch-Lok Connector Crimping Pliers Crimps and seats UG, UR, and UY connectors. Curved handles for greater control. Induction hardened side-cutting knives for long life. ..
Klein T1715 Full-Cycle Ratcheting Crimper - Insulated Terminals Crimps insulated terminals in wire sizes 22-16 (front cavity), 16-14 (middle cavity), and 12-10 (rear cavity). Color-coded wire size markings. Compound lever-action of narrow-span handles puts more crimping power into each squeeze. Comfort-grip plastic handles. Klein T1715 Specifications: Crimps- 10..
Take on various crimping tasks with this Klein Full-Cycle Coax Ratcheting Crimper (T1720). The ratchet release allows for quick removal of incorrectly placed connectors prior to completely the crimp, while the compound lever-action of narrow-span handles puts more crimping power into each squeeze. Equipped with comfort-grip plastic handles for more comfort as you work, the jaws release .. Features: Accommodates wire from No. 10 to 22 AWG. Specially hardened wire cutter in nose. Tapered nose design for working in confined spaces. Crimping die marked for insulated and non-insulated solderless terminals and connectors. Plastic-dipped, cushioned handles for comfort. Hot-riveted joint for smooth action and no handle wobble. ..
Klein 1006 Specifications: • Crimps:10-22 AWG • Handle Color: Black • Overall Length: 9-3/4" Klein 1006 Features: • Designed for crimping non-insulated solderless terminals and connectors. • Specially hardened wire cutter in nose. • Tapered nose for working in confined s..